Eltronicschool. 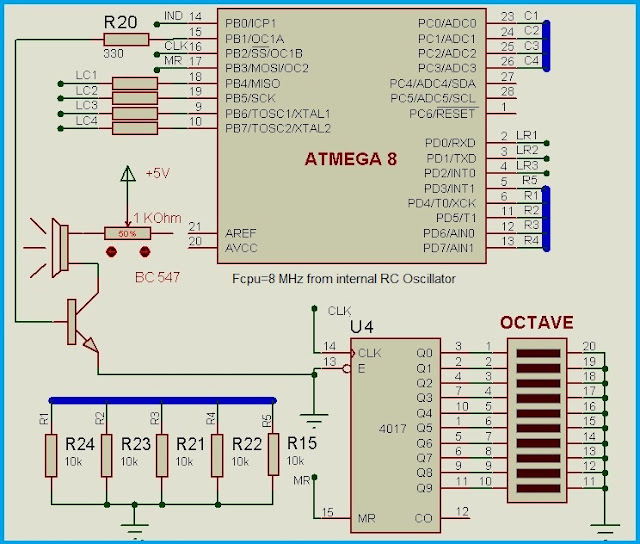 - This is one of the best project for you who want to develop your ability in ATMEGA8 programming and design in this time. This article will discuss to you about how to build music keyboard using ATMEGA8 completed with tune record, save and playback option. Beside we will give you the circuit schematic of Musical Keyboard Using ATMEGA8 with Tune Record, Save and Playback Options and also the simple description of this project, and the last we will give you the link to read more about this project from original source. Circuit schematic like in Figure 1 above is Musical Keyboard Using ATMEGA8 with Tune Record, Save and Playback Options. This article aims at developing a Monophonic (Single note) musical keyboard by generating the musical notes frequencies using a microcontroller (ATMEGA8). The project presented in this article is a 12 Key, Monophonic keyboard with the options. By using a microcontroller with digital outputs, it is possible to generate square waves with the frequencies of musical notes. The 16-Bit timer-counter of the microcontroller is utilized to generate a square wave with desired frequency. The timer counter is operated in CTC Mode (Clear Timer on Compare Match). Each time when a match occurs between the TCNT1 Value and the Output Compare Registers, the Output Compare 1A Pin is toggled. Every time when a key is pressed, the Output Compare Registers of the Timer1 are loaded with a value corresponding to the frequency of the pressed key. And now you can read more about this article Musical Keyboard Using ATMEGA8 with Tune Record, Save and Playback Options from original source using link HERE.